Ant 'n Dec: But it's your votes at home that count. difficult to decide what to do with my hair?" Time Magazine's "Twitter's Biggest Egos, Exposed" is required reading as an introduction to http://tweetingtoohard.com/top "where self important tweets get the recognition they deserve." Unintentional comedy (or at least I think so) from the social media maelstrom. Barack Obama's Facebook Feed is a deliberate pastiche, bit still very funny. I never fail to be astonished by the people and things that we're apparently not supposed to laugh at. Last night as I was listening to Chris's Last FM radio station, and pondering how - sprogglewise - it would infect mine, I decided that he had done enough to earn his own anagram. Henceforth then, Christopher Howell, with a nod towards his nautical bent, shall be the Whole Ship Chortler. The Chortler joins the Bomber, The Burglar, and the Bear (who has his own category) in my descent into incomprehensibility. The final destination is incoherence. Select something below to pipe him on board. When we were watching the new Star Trek movie a couple of weeks ago, the Bomber leaned over and whispered, "I think the ones with the pointy ears are the Treks and the other ones are the Stars." Trekkie lore is acquired a posteriori (sitting down in front of a screen) as opposed to a priori it seems. But Winona Ryder as Spock's mother! Heathers was made 21 years ago? Dear me I feel old. Myself: I had a similar shock in Trevor Nunn's acclaimed 2004 production of Hamlet at the Old Vic, in which Imogen Stubbs (a slip of a girl as far as I am concerned) played Gertrude. Prodnose (adopting sarcastic Cambrian lilt): There's posh you are. You can read about "Twitter, Adderall, lifehacking, mindful jogging, power browsing, Obama’s BlackBerry, and the benefits of overstimulation" in New York Magazine, but The Profit Burglar is off sick and I have to gird my loins and get stuff done. I have so many demands on my time that "12 Essential Rules to Live More Like a Zen Monk," will be more use than Twitter today. Do it slowly and deliberately. You can do one task at a time, but also rush that task. Instead, take your time, and move slowly. Make your actions deliberate, not rushed and random. It takes practice, but it helps you focus on the task. Don't give up on lists of 12 items after the first three. I am not proud, but I have succumbed. 10 months into netbooks, I have given up on Linux and gone back to Windows XP. I just got fed up of not being able to run stuff like the motionbased agent, Nokia PC Suite etc. with out messing about with WINE. Ironically it is just as Chris has launched himself into the self same territory. I am deliberately sneaking the story out on a weekend. A Welsh guy is putting the finishing touches to an Indonesian action movie. (Thanks to Chris for the tip-off.) You can even follow him doing it on Twitter at http://twitter.com/ghuwevans. It all seems so remarkable and unlikely that I am hugging myself in my mind. I wish it Tony Jaa 'Ong Bak' breakout levels of success. I'm falling in love with music all over again with Spotify. It sproggles everything I play over to www.lastfm.com where they are arranged into a library. I think that you can listen to a "radio station" based on it at http://www.last.fm/listen/user/NickBrowne/personal. What an extraordinary thing that is. There is much to think about in social media. I do claim petrol and fares to cover the costs of undertaking my parliamentary work. This includes travelling to various agencies, and going to meetings and other events on behalf of residents. I am not permitted to claim for the congestion charge. I think that she should be able to claim the congestion charge, making me possible the only person in the country who thinks the system partially unfair to Members of Parliament. Anyway, she appears to be on the side of the angels which is all to the good. There is an interactive heat map of MPs' expenses at http://msn.shoothill.com/ which is well worth a look. I met Enoch Powell once. 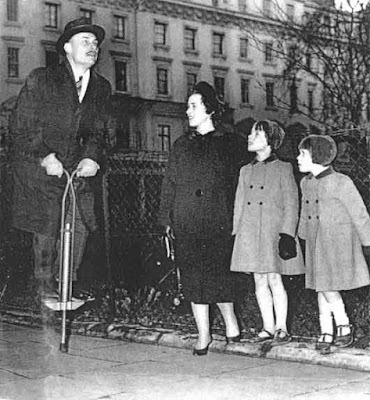 Here is a photo of him on a po-go stick from 1962. My first post since March about Amazon's offerings. 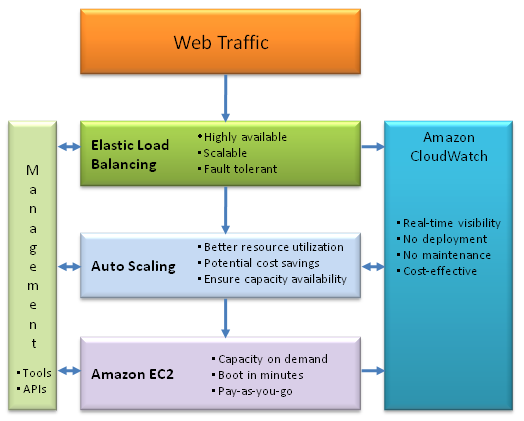 Elastic Load Balancing and Auto Scaling have been launched in the States and are imminent in Europe. The day we can move our auction system onto this infrastructure and let it size itself can't be too far away. What a boon it would have been in the server meltdown that followed our BBC One Show appearance. I noted in passing the other day that Twitter uses Amazon for storing images. I wonder what else the Amazon platform underpins? Immanent as well as imminent? I've been following Marc Canter for three years now, and I think he is on to something with this Open Stack. Like all protocol stacks it is probably more honoured in the breach that the observance, but it is useful tool for arranging thoughts, especially as we are starting to use OAuth in anger for the first time now for some Twitter API development. ...... despite the often good-natured antics, Maciej is sometimes taken aback by the levels of drinking involved. I was at the movies (avec the bomber and a chum) yesterday marvelling at the incongruity of the Beastie Boys 'Sabotage' appearing on the soundtrack of the Star Trek reboot when Google crashed, so it didn't bother me at all. There is an eight year old off sick from school in the office with me today. That is taking up all my spare attention. I started listening to musc via spotify yesterday. Just search for Bach and click play; life gets better. There's a feature called collaborative playlists. I've set one up. If you're on Spotify and follow this link, you can add tracks to it. "Nessun Dorma" Mr Howell? Kids Muay Thai has ground to halt because of problems with premises leaving something of a hole in the life of the bomber who has been doing it since 2006. 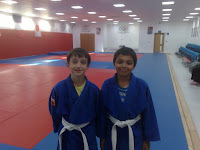 Cycling round the streets the other week however, I stumbled upon a purpose built dojo at Ernest Bevin College, and last night Ben and his mate Prashant bowled up for their first judo lesson which Ben in particular dug mightily. On reading this, I have decided that Marina Hyde should be Prime Minister (for all that she ends a paragraph with a preposition). She joins Immodesty Blaize who will be Home Secretary in my government of all the talents. Smashing the glass ceiling and building the glass menagerie. I was chatting to my Dad about the MP's expenses scandal back in Wales this weekend. He said that, for all the rigorous disdain that should be reserved for the chiselers, it would be nice to here about who - if any - the stand up guys in the cabinet were. "Hilary Benn, Ed Miliband and Alan Johnson emerge as acmes of frugality who make modest and entirely reasonable claims for performing their duties." says Andrew Rawnsley, and a Google straw poll appears to confirm it. The public will demand a cleansing of the Aegean stables. It will be interesting to revisit this post in a year or so, and see whom has been claimed by the greasy pole, and reflect on the deserving poor. I am away in the Principality this weekend, so I am posting this by remote control from yesterday. http://en.wikipedia.org/wiki/Category:Welsh-Americans makes me smile, including as it does Bo Derek, Tom Cruise, and Ginger Rogers. To "retweet" is to repeat/quote someone's tweet. Usually when you come across and interesting tweet and you want to publish it as your own tweet so that people who follow you see it too - you retweet it. The syntax of your tweet should start with the abbreviation RT or the word Retweet followed by the username of the person who tweeted it (e.g @User) and then finish with the content of the actual tweet. The ridiculous things I have to learn at my age. I thought RT stood for "Reply To" until this morning. Oscar Madison: "We're all out of cornflakes. F.U." Took me three hours to figure out F.U. was Felix Ungar! Idly leafing through an interview with Immodesty Blaize (international burlesque superstar) in this week's Time Out over brekky this morning I was astounded to discover that she is as smart as a whip. The biggest shock to my "meat and potatoes" sensibility since I was outraged by how thoughtful and articulate Marilyn Manson could be in answering a question. Back to the drawing board in terms of prejudices it would seem. I also learned yesterday that the Conservative Party has an Online Communities Editor. Google Latitude can tell you where I am (or rather where my mobile phone is) if I allow it. I can share it with friends or the world. Is this good, bad, indifferent, safe or dangerous? Who knows? Poets Ranked by Beard Weight is a classic of Edwardian esoterica, a privately printed leaflet offered by subscription to the informed man of fashion and as a divertissement au courant for reading bins and cocktail tables of parlor cars and libraries and smoking lounges of gentlemen's clubs. Typifying a once-popular, but nowadays seldom-encountered species of turn-of-the-century ephemera, Poets Ranked by Beard Weight has become a rarity much prized by bibliophiles, and one that still stands out as a particular curiosity among the many colorful curiosities of the period. Its author, one Upton Uxbridge Underwood (1881 – 1937), was a deipnosophist, clubman, and literary miscellanist with a special interest in tonsorial subjects. That "exalted dignity, that certain solemnity of mien," lent by an imposing beard, "regardless of passing vogues and sartorial vagaries," says Underwood, is invariably attributable to the presence of an obscure principle known as the odylic force, a mysterious product of "the hidden laws of nature." The odylic, or od, force is conveyed through the human organism by means of "nervous fluid" which invests the beard of a noble poet with noetic emanations and ensheathes it in an ectoplasmic aura. I shall throw away my razor immediately. A couple of random observations from across the channel and across that Atlantic that you may wish to compare and contrast with our government's attitude to the Gurkhas. You can apply for French citizenship if you serve in the Foreign Legion for three years. Further, a soldier who becomes injured during a battle for France can apply for French citizenship under a provision known as “Français par le sang versé” (”French by spilled blood”). "It is my honor and my personal pleasure to be the first to address you as my fellow Americans. ........... You all have your own personal reasons for why you joined the military. But in the service that you render, in the sacrifices that each of you have made and will continue to make, in the commitment you've shown to your adopted nation, you're part of a larger story -- America's story." Cos' I like to look like Nimrod when I'm riding in my car. Or are they hypocrites for singing? 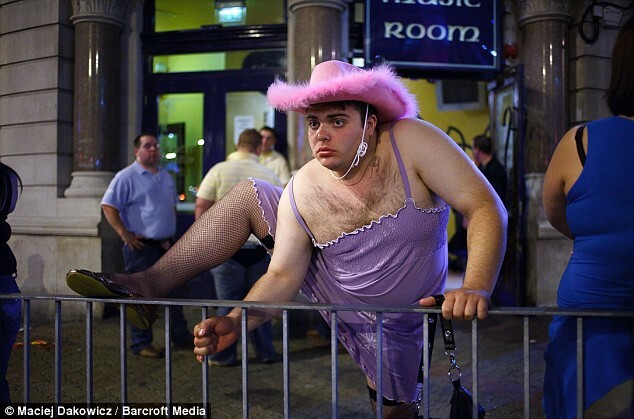 I watched a documentary last night on BBC4 about the British Blues boom. Tom McGuinness talked about playing with Paul Jones in a pub in Colliers Wood, and Bob Brunning featured prominently. Great fun. The Thames Delta indeed, and south of the Fortnum Mason line. I've had to wait at home for a plumber and another guy to look at the bolier most of today. 'Twas on a Monday morning the gas man came to call.